May 5, 2012, the annual Hershey/Blaine County track and field meet at Carey School's Derrick Parke Memorial Field, sponsored by the Blaine County Recreation District and volunteers. 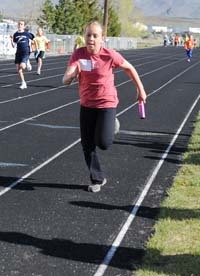 The top two finishers in each event (ages 9-14) qualified for the southern Idaho state meet Saturday, July 7 at Madison High School in Rexburg. School abbreviations are Hailey Elementary (H), Hemingway Elementary (Hem), Woodside Elementary (W), Carey School (C), Camas County (Camas) and Wood River Middle School (WRMS). - Girls' standing long jump: 1—Josie Conley (H) 5-4.5. 2—Lauren Roberts (H) 5-4. 3—Sascha Leidecker (Hem) 5-3.75. 4—Caroline Estep (Hem) 5-2.75. 5—Abigail Pincock (C) 5-1.25. 6—Carol Morgan (H) 5-0.75. - Girls' softball throw: 1—Kylie Wood (C) 76-4. 2—Samantha Boyd (B) 73-2. 3—Sayler Peavey (H) 70-3. 4—Bailie Morey (C) 68-0. 5—Olivia Miller (W) 58-0. 6—Jesse Burks (Hem) 55-0. - Girls' 50m: 1—Sascha Leidecker (Hem) 8.35. 2—Bailie Morey (C) 8.46. 3—Lilli Cuellar (Camas) 9.10. 4—Myah Barney (B) 9.14. 5—Kylie Wood (C) 9.22. 6—Zoe Bacca (Hem) 9.23. - Girls' 100m: 1—Sascha Leidecker (Hem) 17.07. 2—Abigail Pincock (C) 17.63. 3—Caroline Estep (Hem) 17.70. 4—Josie Conley (H) 17.71. 5—Trinity Dilworth (H) 17.76. 6—Anna Rose Bernbaum (Hem) 17.84. - Girls' 200m: 1—Lauren Roberts (H) 36.09. 2—Josie Conley (H) 36.79. 3—Trinity Dilworth (H) 36.83. 4—Daisy Buxton (Hem) 38.81. 5—McKinnlee Curtis (C) 44.30. 6—Lexi Fuchs (B) 44.60. - Girls' 400m: 1—Bailie Morey (C) 1:23.56. 2—Lauren Roberts (H) 1:23.95. 3—Caroline Estep (Hem) 1:26.83. 4—Annie Burks (Hem) 1:28.65. 5—Jesse Burks (Hem) 1:30.65. 6—Anna Rose Bernbaum (Hem) 1:31.22. - Girls' 400m relay: 1—Hemingway (Burks, Burks, Buxton, Leidecker) 1:11.31. 2—Carey (Morey, Wood, Pincock, Versis) 1:12.46. 3—Hemingway (Bacca, Estep, Bernbaum, Hogan) 1:12.57. - Boys' standing long jump: 1—Logan Verst (H) 6-5.25. 2—Anthony Corrales (H) 5-11.25. 3—Brigham Parke (C) 5-6. 4—Zane Barckholtz (H) 5-2.5. 5—Bryce Foster (C) 4-10. 6—Avery Anderson (H) 4-9.75. - Boys' softball throw: 1—Brigham Parke (C) 110-10. 2—Audari Tamayo (W) 88-5. 3—Jake Gorham (Hem) 85-0. 4—Bryce Foster (H) 73-5. 5—Zach Younger (Hem) 71-10. 6—Sawyer Mecham (C) 62-6. - Boys' 50m: 1—Kaiden Minnick (B) 8.64. 2—Anthony Corrales (H) 9.05. 3—Audari Tamayo (W) 9.06. 4—Zane Barckholtz (H) 9.48. 5—Daniel Duran (W) 9.89. 6—Mario Ibarro (H) 10.53. - Boys' 100m: 1—Kaiden Minnick (B) 16.81. 2—Audari Tamayo (W) 16.98. 3—Zach Younger (Hem) 17.01. 4—Dallin Parke (C) 17.21. 5—Carson Simpson (C) 17.66. 6—Anthony Corrales (H) 17.79. - Boys' 200m: 1—Kaiden Minnick (B) 33.69. 2—Logan Verst (H) 34.73. 3—Dallin Parke (C) 35.44. 4—Avery Anderson (H) 38.10. 5—Jesus Villaneuva (C) 40.19. 6—Sawyer Mecham (C) 40.90. - Boys' 400m: 1—Brigham Parke (C) 1:18.54. 2—Carson Simpson (C) 1:18.95. 3—Logan Verst (H) 1:20.93. 4—Jake Gorham (Hem) 1:24.32. 5—Zach Younger (Hem) 1:25.84. 6—Avery Anderson (H) 1:32.54. - Girls' standing long jump: 1—Stella Barsotti (WRMS) 6-8. 2—Madison Ferris (Hem) 6-3. 3—Clara Jenner (Hem) 6-2.75. 4—Payton Bacca (Hem) 6-2.75. 5—Jenna Nurge (Hem) 6-1. 6—Sariah Nilsen (B) 6-0.25. - Girls' softball throw: 1—Laken Wolf (Camas) 99-7. 2—Luci Cuellar (Camas) 96-2. 3—Athanasia Versis (C) 89-11. 4—Shantell Chavez (C) 81-10. 5—Kodi Green (C) 74-3. 6—Chantelle Styhl (C) 57-9. - Girls' 100m: 1—Jenna Nurge (Hem) 15.33. 2—Laken Wolf (Camas) 15.41. 3—Lindsey Morey (C) 15.49. 4—Chantelle Styhl (C) 15.77 and Amelia Morgan (H) 15.77. 5—Luci Cuellar (Camas) 15.78. 6—Stella Barsotti (WRMS) 15.83. - Girls' 200m: 1—Clara Jenner (Hem) 34.02. 2—Stella Barsotti (WRMS) 34.21. 3—Laken Wolf (Camas) 34.38. 4—Lindsey Morey (C) 34.51. 5—Madison Ferris (Hem) 35.36. 6—Athanasia Versis (C) 35.46. - Girls' 400m: 1—Kirsys Campbell (WRMS) 1:17.85. 2—Keely Wolf (Camas) 1:21.72. 3—Shantell Chavez (C) 1:34.61. 4—Kodi Green (C) 1:40.96. - Girls' 800m: 1—Kirsys Campbell (WRMS) 2:52.08. 2—Keely Wolf (Camas) 3:02.08. 3—Zina Hatch (C) 3:29.13. - Girls' 400m relay: 1—Hemingway (Bacca, Nurge, Jenner, Ferris) 1:03.90. 2—Camas (Wolf, Cuellar, Wolf, Blodgett) 1:04.64. 3—Carey (Styhl, Morey, Versis, Green) 1:58.00. - Boys' standing long jump: 1—Easton Beck (WRMS) 6-1.75. 2—Will Griffith (Hem) 6-0. 3—Garrett Stouffer (B) 5-6.5. 4—Brayden Olson (C) 5-6. 5—Ben Luck (Camas) 5-4.25. 6—Carson Smith (W) 5-2. - Boys' softball throw: 1—Trevor Kirkland (C) 116-0. 2—Porter Mecham (C) 112-10. 3—Aaron Andozola (H) 112-5. 4—Trey Smith (Camas) 105-7. 5—Ben Luck (Camas) 95-2. 6—Christian Bothwell (H) 90-2. - Boys' 100m: 1—Jaren Bothwell (WRMS) 14.62. 2—Will Griffith (Hem) 15.51. 3—Porter Mecham (C) 16.34. 4—Aaron Andozola (H) 16.58. 5—Luke Worst (Hem) 16.84. 6—Porter Larna (C) 17.11. - Boys' 200m: 1—Jaren Bothwell (WRMS) 30.80. 2—Brayden Olson (C) 34.01. 3—Easton Beck (WRMS) 34.27. 4—Will Griffith (Hem) 34.34. 5—Christian Bothwell (H) 35.25. 6—Luke Worst (Hem) 35.90. - Boys' 400m: 1—Brayden Olson (C) 1:16.40. 2—Garrett Stouffer (B) 1:19.57. 3—Tanner Mecham (C) 1:19.60. 4—Christian Bothwell (H) 1:21.08. 5—Easton Beck (WRMS) 1:22.25. 6—Trey Smith (Camas) 1:29.35. Boys' 800m: 1—Tanner Mecham (C) 2:49.89. 2—Garrett Stouffer (B) 2:50.41. - Girls' standing long jump: 1—Chandler Wakefield (WRMS) 6-7.25. 2—Katherine Lemma (WRMS) 6-2.5. 3—Riley Revallier (WRMS) 5-8. 4—Emma Coulthard (WRMS) 5-6. 5—Amy Cantrell (WRMS) 5-1. - Girls' softball throw: 1— Breanna Durtschi (WRMS) 71-2. - Girls' 100m: 1—Chandler Wakefield (WRMS) 15.32. 2—Katherine Lemma (WRMS) 15.88. 3—Riley Revallier (WRMS) 16.61. 4—Emma Coulthard (WRMS) 16.85. 5—Kya Cutler (C) 16.98. 6—Alex Garcia (WRMS) 17.15. - Girls' 200m: 1—Alex Garcia (WRMS) 35.11. 2—Kya Cutler (C) 35.47. - Girls' 800m: 1—Amy Cantrell (WRMS) 3:10.31. - Girls' 1600m: 1—Amy Cantrell (WRMS) 7:21.68. 2—Breanna Durtschi (WRMS) 9:50.87. - Girls' 400m relay: 1—WRMS (Wakefield, Coulthard, Revallier, Lemma) 1:03.79. - Boys' standing long jump: 1—Nathan Stouffer (WRMS) 6-5.25. 2—Elliott Portillo (WRMS) 5-10.25. 3—Landon Nurge (WRMS) 5-1.25. - Boys' softball throw: 1—Tyson Mecham (C) 136-4. - Boys' 800m: 1—Tyson Mecham (C) 2:36.82. 2—Nathan Stouffer (WRMS) 2:45.00. 3—Elliott Portillo (WRMS) 3:04.08. - Boys' 1600m: 1—Nathan Stouffer (WRMS) 6:01.11. 2—Tyson Mecham (C) 6:24.92. 3—Elliott Portillo (WRMS) 6:43.95. - Girls' standing long jump: 1—Charley Stevens (B) 4-9. 2—Jacy Thomas (W) 4-9. 3—Alexis Nachtman (W) 4-7.5. 4—Madison Miller (W) 4-5.25. 5—Abigail Verst (H) 3-7.25. 6—Lilly Cuellar (Camas) 4-4.25. - Girls' softball throw: 1—Madison Miller (W) 49-1. 2—Haley Hobson (W) 38-6. 3—Jette Ward (B) 37-1 and Sailor Ward (B) 37-1. 4—Eve D'Ambrosio (Hem) 36-2. 5—Jacy Thomas (W) 35-0. 6—Abigail Armstrong (B) 34-0. - Boys' standing long jump: 1—Ross Saleen (B) 4-11.25. 2—Sebastian Buxton (Hem) 4-10.75. 3—Owen Stouffer (B) 4-7.75. 4—Gabe Nilsen (B) 4-4.5. 5—Nathan Durand (B) 4-4. 6—Luke Baker (H) 4-3. Spencer Gaudreau (W) 84-7. 2—Riley Morey (C) 75-8. 3—Tommy Nisson (B) 67-10. 4—Tristan Smith (B) 65-0. 5—Ross Saleen (B) 64-0. 6—Chase Bennion (C) 63-5.